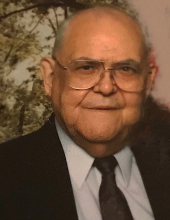 James Ramon Childers, age 95 of Allen, Kentucky, passed Thursday, January 17, 2019 at Riverview Nursing Home, Prestonsburg, Kentucky. He was born March 3, 1923 in Draffin, Kentucky to the late Jim Harve & Ardelia Martin Childers. He was the husband of Evelyn Marie Ratliff Childers. He was a retired medical tech and US Veteran. Along with his wife he is survived by his Sons: Tony Ray (Judy) Childers & Terry Dean Childers both of Allen, Kentucky; Grandchildren: Rachael Harmon, Heather Hackworth, Terra Hutchinson, Jeremy Childers, Riley Anderson & Morgan Childers; Great Grandchildren: Trae Harmon, Madison Harmon, Jack Harmon, Taylor Meade, Lauren Meade, Sophia Hutchinson & Shane Childers. Along with parents he was preceded in death by his Sisters: Mildred Belcher& Irene Childers. He will be missed by all that knew and loved him. "Email Address" would like to share the life celebration of James Ramon Childers. Click on the "link" to go to share a favorite memory or leave a condolence message for the family.